Do you pay too much for advertisements in wrong places, then TravellingGroup.com�offers you advertisements in different sizes to absolutely low prices. 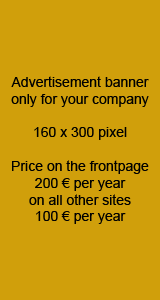 Advertising on one of our popular -----Guiden.com sites. Are you paying too much for advertisements in wrong places, then come to us and we will help you to an cheap announcement in our webpage's. TravellingGroup.com offer you advertisements in different sizes to absolutely low prices - and in the right place! 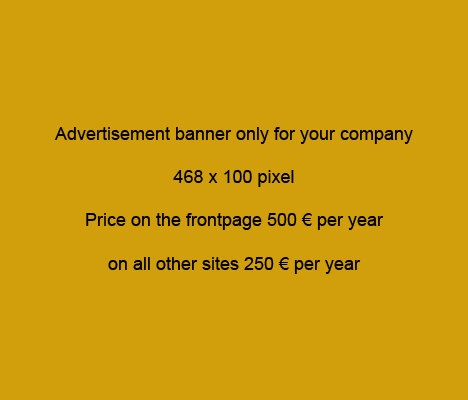 The advertisement will generally be placed in very good positions and the banner size that you want with link to your own homepage, or with a link to a popup window containing your announcement. A text link is another possibility. When you are on the front site your business won't be hidden under something else, and we will also draw our readers attention to the fact, that you are supporting us, so we hope they will support you. When we succeed in this, every one will be pleased. The prices below are only for the announcement. The advertiser will cover the expenses for producing the layout to the advertisement. Contact us and tell us the size of announcement. If you have your own material, you can place it on a file and mail it to us. We are forwarding a layout, for your approval. After your approval, we put it online, and you will receive an invoice. PS. Please notice, that the prices are for one year.